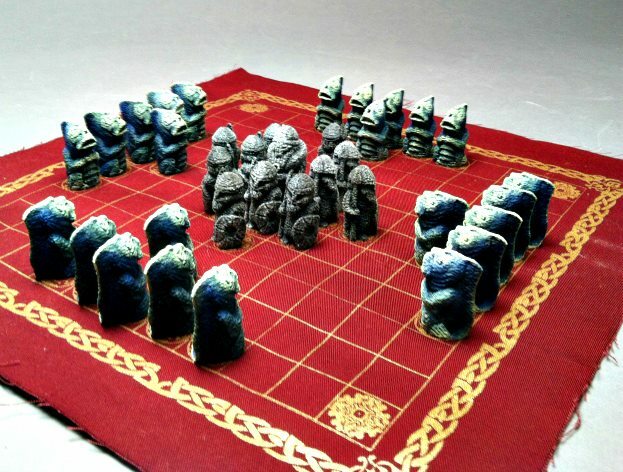 As I noted in a comment at the time, I was deadly envious of Zen‘s recent post, The VA bows Before Mjolnir, but I feel a little better now that I can make my own post about Hnefatafl, which Kristan Wheaton recently characterized as The Ancient Viking Game Every Intelligence Professional Should Play. It is an asymmetric game. As you can see from the board above, one side starts in the center and the other side surrounds it on all four sides. One side outnumbers the other by about 2:1. The sides even have different victory conditions (the player with the pieces in the center need to get the “King”, the large playing piece in the middle of the board, to one of the corners. The other player is trying to capture the King). It is not too hard to see a game such as this one incorporated into courses, classes or discussions of asymmetric warfare. It is a conflict simulation. Most historians agree that there were relatively few large scale battles involving Vikings. Instead, most of the time, combat resulted from raiding activities. Hnefatafl seems to reflect the worst case scenario for a Viking raider: Cut off from your boats and outnumbered 2:1. It provides a deep lesson in strategic thinking. Lessons in both the strategy of the central position (hundred of years before Napoleon made it famous) and in the relative value of interior vs. exterior lines of communication are embedded in this game. I really, really like the asymmetry of this game — WTG, Norsepersons! This entry was posted on Monday, July 29th, 2013 at 12:35 am	and is filed under Charles Cameron, games, myth, norse, Uncategorized, warriors. You can follow any responses to this entry through the RSS 2.0 feed. Both comments and pings are currently closed. Superb find – I have never heard of this one, Charles! I’ve been playing Hnefatafl ever since I learned about it in an course I took back in 2007 while at Mercyhurst College. The Scandinavian monarchs that came along later had obvious uses for battles (as in Harald Hardrada’s famous ill-fated quest in 1066). Paddy Griffith wasn’t impressed with their record of victories in the Viking Art of War (something near 50% of the Viking engagements went their way), but as I argued in a term paper, that was pretty impressive considering that those battles usually found the Vikings in very unfortunate circumstances. They were trying to avoid losing warriors against their numerous and wealthier opponents. And since most Vikings were raiding other Scandinavians, you usually had only your wits and cunning to count on. Hnefatafl was all about the training to get out of those hairy situations without losing your leader. I even bring the game to Midsummer festivals to try to get my Swedish relatives to play the game their ancestors may have been playing to train for survival. The games are actually pretty cheap, or you could just play with it online if you just care about the game dynamics. But what’s the fun of playing Hnefatafl without the little Viking figures? Thanks! It was new to me, too. Good to make a Mercyhurst connection — and to meet a <span style=”font-family: ‘Trebuchet MS’, Arial, Verdana, sans-serif; font-size: 12px;”>Hnefatafl enthusiast. It seems the best breakout strategy for white (at least from what I see so far) is what they call in football the “diamond formation”. The advantage of internal lines is also the military argument for Israel returning to it’s pre-1967 borders. In their case favorable terrain helps too. Nice! Has anyone published rules for it?